Where do I use my Garden Bird voucher code? Subscribe to the newsletter and have all the latest news and deals delivered straight to your inbox. If your garden is home to some feathered friends, these friendly birds could always do with some looking after, especially during colder months. Operating online since 1994, Garden Bird is a founding member of the Birdcare Standards Association and is therefore committed and passionate about providing the very best for your garden birds. Browse through the charming and comprehensive sive to uncover the great selection of innovative and practical products including bird food which comes in all shapes and sizes, from live mealworm and honey and fruit cocktails to ultra-high protein seed mixes, grains and insects. Make it easier for the birds to gnaw at their food with a seed feeder or squirrel resistant feeder. Suet Pellets and cakes are traditional favourites of birds and provide an incomparable source of energy for birds, especially in winter months. It’s possible to also welcome other wildlife delights including butterflies and hedgehogs into the garden with food mixes and friendly plants which can encourage and support diversity. There is so much to explore at Garden Bird so why not check out the huge online selection today. If you find that your bird feeders and persistently running low, especially during spring and summer months, join the Garden Birds regular Ordering Club. To join the club, you will need to commit to an order in a minimum or four separate months by filling out the form provided. You will also be guaranteed a 10% discount each time on top of any other discount available when your order this way. This is a great way to ensure that your bird feeders are regularly topped up and allows you not to worry about ordering your stock. If you want to save money whilst you shop online at Garden Bird, check out our great selection of money-saving deals right here on our Garden Birds deal page. We know how much you love to save money online which is why we list a wide array of tempting deals to help you grab cash off your order when you use one of our deals at the checkout. Browse through the excellent collection of products a Garden Bird and don’t forget to check here a deal which could make you a handy saving. Available only at Garden Bird, Ultiva is a trusted and extensive collection of quality bird food seed mixes which are carefully formulated to provide nutritional enrichment. Packed with a balance of safe and effective ingredients and developed in accordance with strict BAS regulations, you can rest assured your birds are receiving the very best food possible. Check our the selection today which includes everyday seed mix, high protein insect mix, spring, autumn & winter mixes and much more. Shop online at Garden Bird with NetVoucherCodes and grab all the bird seed mixes you need for less by shopping with a Discount Code - saving you money on the essentials for your birds. Choose from the huge selection of premium quality straight bird food on offer online at Garden Bird and rest assured you’re getting the best foods available at affordable prices. Enjoy Peanuts, sunflower seed hearts, niger seeds, peanut granules and much more which are great for feeding to fledgelings and seed feeders. Give your Garden Birds the nutrients and food they deserve and they will keep flocking back more and more for tasty foods they love. Return any unwanted goods up to a maximum period of 30 days starting from the day after you receive the goods, except perishable goods, and up to 30 days for damaged/faulty goods. For second to none bird care, look no further than Garden Bird - one of the UK’s leading bird specialists. Providing the best bird food around along with a great selection of accessories and bird suet, you can rely on Garden Bird for quality and comprehensive products which are guaranteed to satisfy our flying friends. Shop online today with the added bonus of one of our Garden Bird Voucher Codes which you can find here on our deals page courtesy of NetVoucherCodes, you can save a great deal of money when you order online. 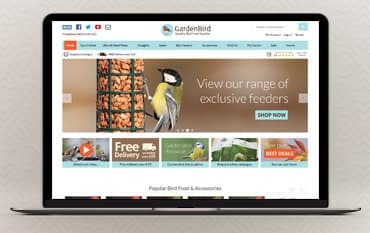 So, whether you’re looking for bird seed mixes, nest boxed or bird baths, find all you need on more online at Garden Bird and save money whilst you shop.